It is no surprise that David Walliams has been described as the new Roald Dahl. That may seem like a huge statement, and it may seem like Dahl's shoes would be impossible to fill, but if you have read one of Walliams' books you will know that there is truth in this statement. This book covers the whole gamete of adult characters. The lazy, fat uncaring step-mother, a well meaning but disenchanted father, the friendly shop owner, the principle who looks like an undertaker, the spitting bully and the disgusting, vile burger van man. The star of our story is Zoe, who must endure the afore mentioned characters. This ginger haired heroine dreams of touring the world with her trained guinea pig, but a sudden death of her beloved....cuts her dreams short. Luckily for Zoe, all is not lost, when she finds a baby rat in her bedroom. With a little bit of TLC, some bread crusts and training Armitage (the rat) may indeed be tour ready. 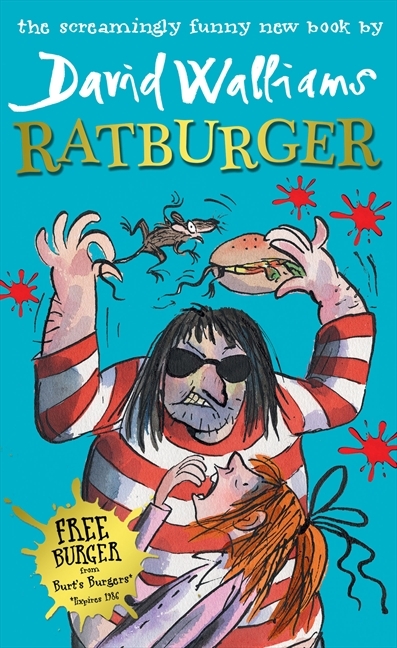 Things really get ugly when Zoe comes home from school on day, only to find that her stepmother has organised a rat catcher to inspect Zoe's room, because her keen sense of smell indicates that there is a rat in her room! The rat archer bears a striking resemblance to the disgusting burger can man! What would the burger van man need rats for?? The answer is horrific and disgusting! If it all sounds a little bit too horrible and all of the adults seem a little bit too awful, do not worry, the most important adult character does redeem himself. Zoe's Dad, when faced with his daughter begging for his help, steps up and does the right thing!